In the Giants scheme that implements both 3-4 and 4-3 concepts, their quest for more edge talent can dip in to multiple forms and identities of the role where as in their former 4-3 days, there were certain players that just didn’t fit. The current status of the edge presence on this team is among the weakest in the NFL purely from a personnel point of view. The “headliners” if you want to call them that are second-year, super-athlete Lorenzo Carter who flashed at times as a rookie and free agent signing Markus Golden, who has missed 17 games since 2016, a year in which he recorded 12.5 sacks. Kareem Martin offers solid run defense from his backup role and Avery Moss is likely in his make or break third season after no impact to this point. Summary: Junior entry. Son of John and brother to Joey, both 1st round picks. After winning the 2017 Big 10 Defensive Lineman of the year Award, Bosa entered the 2018 campaign as the nation’s top prospect and he more than strengthened the label through 4 games this past fall. He had 6 TFL and 4 sacks but an abdomen injury put him on the sideline and he opted to not return. Despite a lack of ideal experience, Bosa still sits at the top of this class because of what he has shown on tape and his lineage. His physical traits may not jump off the screen like past top edge prospects, but the way he plays the game via technique, awareness, power, and hunger is more than enough to warrant a high pick. Bosa won’t ever be the best in the league, but he will be a building block asset for a long time. 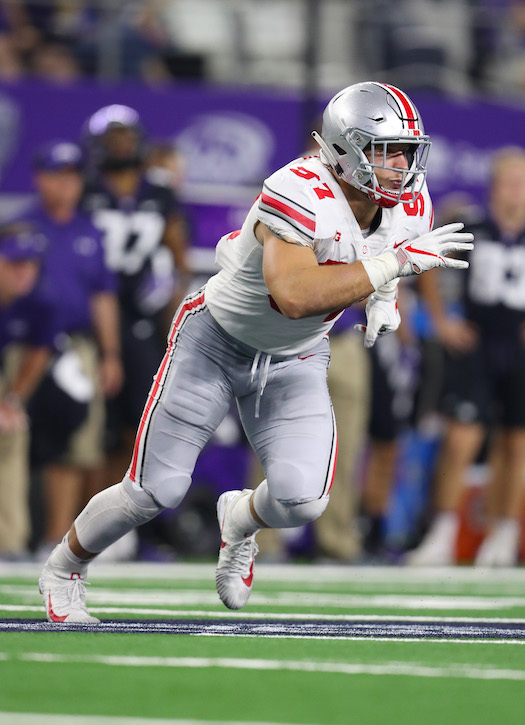 *Bosa leaves the strenuous grading process as my top prospect, but I can’t say I view him on the same level as guys like Myles Garrett and Bradley Chubb. I am confident he will be a player, but the lack of game experience and the fact his brother has been injury riddled so far in his young career create some hesitation. The one thing I go back to is how many different faces his game has via talent and mental approach. The upside is elite, no question. However I think his floor may be lower than what you want out of a top pick. Summary: A multi stop career that began at Michigan State ended with two straight 1st Team All SEC seasons. Sweat has been arguably the top edge rusher in the conference since the start of 2017 that has performed his best against his top competition. He shows up weekly and it seems to be that it is only a matter of time before he makes a play. Sweat has the ideal NFL body with what appears to be the proper blend of tools and desire. While he may need some time to add meat on that frame, his upside is that of a solid starter with a specialty in edge rushing and playmaking via speed and range. *The pre draft process boosted Sweat from borderline first rounder to a potential top 10 spot on my board. He outperformed expectations at the Senior Bowl and put together one of the most impressive combine performances in history. Lastly, this kid has been notably impressive in interviews and whiteboard sessions from what I have been told. While I like everything about the past few months, the tape has some holes that we can only hope get filled in the coming years. I don’t love his movement in short areas, which is where football is played. And there are some power issues from his lower half, something that can ruin potential. A high risk, high reward player here that needs the right system and right role. Summary: Third year junior entry. Has been a team-leading force since 2016, recording 50 TFL and 27.5 sacks. He has proven to be a force against his stiffest competition over the years and will be ready for NFL action week 1. Ferrell is the stereotypical 4-3 defensive end that can stay on the field in all situations. His subtle, but vital techniques need work as he won’t ever be a “blow by you” type edge rusher, but the tools he currently has combined with the passion he plays with makes him a safe bet to be a very good player at the next level. *Perhaps some of his production has been inflated by the abundance of talent around him, but you have to like the tools and grit here. Ferrell is one of the top hustlers in this class and I have several game notes from the past two years that note the passion he plays with. I think that can really translate. There is some stiffness to him that gives me hesitation to call him a sure top 10 guy, but I still see a 1st round talent that can play right away. Summary: Three year starter that showed a steady progression throughout his career that ended with him being named 1st Team All SEC and a consensus All American as a senior. Allen gained 20 pounds last offseason and combining that with his top tier athleticism has vaulted him in to the 1st round tier, maybe even in to the top 10. At his size with his frame, Allen is a rare athlete that shows the kind of skill set that screams upside. There are important strength and power components to being a pass rusher that aren’t quite there yet, however. His eventual upside is as high as any player in the class, but it’s hard to call a rusher elite that struggles against power blockers. He still has a little ways to go. *Allen has been labeled an automatic top 5 player in this draft. I do have a 1st round grade on him but I don’t think he is close to the elite level. I love the frame and I do think he has the potential to put on even more weight, but I borderline think it is mandatory for him to add the power to his game. He lost too many one on one battles where he didn’t get the initial position advantage and that rubs me the wrong way. However I love how he can fill multiple roles and I think he plays the game the right way. He will be dependably and consistently solid, but that is where it ends for me. Summary: Junior entry. Former blue-chip recruit with a tool set that was ready for NFL action two years ago. Gary earned 1st Team All Big 10 honors two straight years and continued to display a top tier tool set that took over games at times. The issue here is a lack of consistency and production. For a player that has such a distinct physical advantage over opponents, there weren’t enough lays being made to make him an elite draft prospect. He did fight through a lower body injury in 2018 but he still has the boom-or-bust label attached to his name. *From what I have seen and heard, you are one of two people when it comes to Gary. One that falls in love with the tools and occasional plays, thus labeling him a legit top 10 prospect. Or you’re like me, one that respects the upside he brings to the table but just constantly felt underwhelmed by the tape. I always left the times I scouted him wanting more. He did play through a couple of injuries over the past two years but I can’t label him the top tier guy that many do, including the one scout I respect the most. For the record I think he goes top 10 and I do think NYG is looking at him hard at #6. Summary: Two year starter that has been one of the most productive defensive ends in the ACC over that span. The two-time All ACC honoree totaled over 40 TFL and 18 sacks over his career from multiple spots along the defensive line. He is not a traditional burner that explodes up the edge, but his skill set is advanced even by NFL-measures. The technique is top notch and combined with his power, size, and strength he will be a versatile force in the league. This inside-out defender is a sure bet to be an effective starter with the potential to be a star. *This is a name I am surprised isn’t getting more talk when it comes to NYG picks, notably the 2nd round. Allen is made for the 5 technique, a spot I think NYG will be looking to fill with another body or two in the coming in weeks. He isn’t the same athlete that JJ Watt is, not even close, but the similarities to their styles is very notable. Hands and footwork, versatility, toughness, IQ, and grit. Allen faced off against some solid talent over the past two years and he is the kind of guy that elevated his play against the toughest opponents. His Clemson tape was some of the best I saw all year. Summary: Fifth year senior. Began his career at Lousiana-Monroe where he won the Sun Belt Conference Newcomer of the Year Award in 2015. Banogu spent two years in the Big 12 with TCU and recorded 34.5 TFL and 17 sacks. When it comes to the ideal measurables of an NFL edge rusher, Banogu comes up a bit short when it comes to size and speed. There is a lot to like in his game, however. He is really crafty, powerful, and balanced. While some of his tricks may not work on NFL-caliber blockers, he is a gamer that will find ways to get the job done. He has consistently produced at a high level every year he was on the field. *Banogu caught my eye in 2017 when a scout tipped me off before anyone knew him. I’ve had my eyes on him ever since and I think he would be a near-ideal fit for the Giants edge role opposite of Lorenzo Carter. I think there is some Vernon in him, the younger, more productive version of Vernon. Love him in a phone booth and there is more explosion there than people think. TCU misused him a bit and I think his ceiling is as high as any of the guys on this list. Summary: Junior entry. A breakout performer in 2018 that earned 1st Team All SEC honors. Polite’s ability to fire out low and fast with easy agility can make him a tough guy for blockers to lock their paws on to. If that is the case, Polite will win several battles each week and produce at a high rate. His lack of power presence makes him a bit of a one trick pony, however and the run defense may be a detriment. In the right edge rushing roe, Polite can be a stud but the lack of prowess across the board keeps the final grade down a notch. *The pre-draft process has been odd here. Polite did not look good in workouts, both his times and his body. Then he had some very questionable interviews with the media and it sounds like he didn’t impress during team meetings. If you watch the right tape with him, though, he looks dominant at times. He can play at a really high speed with plenty of twitch and bend. He looks lethal at times. High risk, high reward. Summary: First Team All Big 12 defender finally blossomed in 2018, his senior year. Omenihu is one of the more impressive specimens in this class when you are looking at simple triangle numbers. He has the NFL body right now and will make an impact early on as a run defender from any and all angles of the defensive line. Omenihu can be graded at different positions based on which scheme he is placed in to, but no matter what his upside is intriguing and he will be a physical force against the run. If he can continue to progress as a pass rusher the way he did in 2018, he will be one of the more dangerous inside-out defenders in the NFL. *Similar to Allen above, Omenihu has the traits and playing style that can really fit in to this scheme at the 5 technique, a position of need. When looking at this kid’s body and 2018 film, it is easy to get really excited about him. But I am still unsure if he has the football player in him from an awareness and technique perspective. Those are the 2 red flags on his grading sheet but if a team can really coach him up, he can be a big time player. Summary: Senior with two-plus years of starting experience. The 2nd Team All SEC pick won’t wow anyone with production or athletic ability, but his pro-caliber power presence and overall consistency was noteworthy in the SEC. Ledbetter isn’t the kind of defender that will stand out play to play, but those that really pay attention will appreciate how dependable and violent he is. The blue collar, versatile threat won’t ever jump off the stat sheet but he is the kind of quietly effective defender that can start for a decade in the league. The team that drafts him needs to have a plan for him, as the talent is limited but his ability to role-play at a high level is there. *”Heavy hands” is something this front office and coaching staff have discussed often when looking for defensive linemen. This is the one thing I noticed about Ledbetter over and over during tape study and I think he is at a different level than other prospects. I think he can be a really solid 5 technique, one that starts in the league for a long time but nobody appreciates enough. And I think there is more pass rush potential with him than people think, as Georgia had him do a lot of the dirty work. Summary: Fifth year senior. Two time 1st Team All Big 10 and capped his career with an All American campaign in 2018. Winovich was “the other guy” on that Michigan defensive line over the past two years, with much of the attention being on teammate Rashan Gary but it was Winovich that led the Wolverines in tackles for loss. He doesn’t have the ideal body or frame for the NFL tranches right now, but his style of play and well-balanced attack will translate to at least a base-level of success in the NFL. Motors like this combined with technique and quickness trend well at the next level. *The biggest question with Winovich entering the draft is the injury and surgery he had to his hand/wrist area. I’ve been told that thing may keep him off the field longer than expected, may even hamper the start of the 2019 regular season. Take that out of the picture because you have to think eventually that is a complete non factor, Winovich has traits and techniques combined with the mentality that will make a difference. How much of a difference? I don’t see him as a double digit sack guy but I do see a three down player that will be consistent and reliable. Summary: Junior entry. A two-plus year starter that began his career earning Freshman All American honors and ended his career with a 1st Team All ACC honor. Burns has the explosive first step and easy bend that can make him a terror off the edge. He played small in college and while there may be some issues keeping mass on, his role as pure speed rusher will be a factor at the next level. The issues with him revolve around power and run defense, both areas of his game that were apparent weaknesses. If he finds the right role, ideally a 3-4 outside linebacker without run defense responsibilities, he can be a factor. *I am pretty low on Burns, as many have him as a sure thing 1st rounder, potentially even a top 15. The burst is there and I think may are assuming he will add and keep on mass. I fear edge guys that are purely based on burst and speed, especially guys that don’t have top shelf burst and speed. Burns has a lot of attractive tape on multiple levels but he disappears way too often. Boom or bust type that could be a stud in the right role. Summary: Fifth year senior. First Team All Conference USA in 2016, 2017, and 2018 respectively. He ranks number one overall on the FBS career sacks list, passing Terrell Suggs during his last game. The 2018 Conference USA Defensive Player of the Year award winner brings an elevated skill set to the table along with the mentality every defensive coach wants to work with. He is a strong and powerful bully that can play a subtle finesse game when needed. While the jump in competition can make things slow for him at the start, Ferguson has the kind of upside and aggression that will make things happen in the pros. Just give him time. *A lot of media chatter around him falling because of a bad 3-Cone and Short Shuttle time. Just another example of some people that don’t watch game tapes enough overreacting to workouts. Ferguson has been a day 2 guy the entire process for me and nothing about his workouts changed that. This is the kind of guy you want on your line if you need more physical play. He is a big, mean dude that can help change the personality of a team. He won’t be a Terrell Suggs pass rusher in the league, but he can be more than stout against the run and will find a way to consistently impact the pass rush. Summary: Fifth year senior. The former high school quarterback has gained over 70 pounds in his time at Charleston and slowly but surely progressed each year. His career ended with three straight All-Mountain East honors including a senior season where he won the conference’s Defensive Player of the Year Award. Even though he has 5 years of training and playing experience on the defensive side, he is still a bit of a developmental prospect that has a lot of work to do from a technique standpoint. With that said, players at his size and speed with his kind of hustle simply don’t come around often. He lined up all over the defensive line and that kind of role will carry over to the NFL. High upside pick that can be trusted based on hustle and grit. *Several scouts think this kid can be the top 5-tech in the class from a developmental perspective. His name keeps coming up in discussions which I always find noteworthy. He held it together at the Senior Bowl pretty well and now that his body mass is ready to go, it is all about cleaning up the techniques and skillset. He might be a 1-2 year project but there is an upside here paired with a high floor that teams like to take chances on. Summary: Fifth year senior. A rotational player for the first three years of his career, Collier finally got the starting nod in 2018 and ended up on the 1st Team All Big 12 defense. The 280 pounder with top-tier length and easy knee bend showed pro-caliber technique and a never ending engine. He brings a physical brand to the line and showed enough production as an inside rusher to give him the versatility that most teams want on third down. While his impact as a speed rusher is limited, the ways he can help a defense are too numerous to overlook. Collier is an underrated prospect that will be a better pro than he was in college. *One of the more underrated players in the class. Collier has a lot of tools and quality tape but because he was just a one year starter, there is some hesitation. I trust that his skill set fits really well in to the league and a team with a multi-look front can keep this guy on the field constantly because of how well he can adjust his approach. A physical tone setter that already checks a lot of pro-ready boxes. 38 career starts and a three time All Mountain West honoree. Reed is very undersized and may not have the frame to handle much more weight, but I do think the pro-caliber strength and conditioning program will put him in the right direction. He is a practice squad type guy that comes in to the league with a skills et that can create issues. He has excellent footwork, quickness, and bend. Just a kid that knows how to beat blockers in a variety of ways. If he can add some power to his game, he can be a difference maker. The way I look at the Giants edge roles and situation is this. They need a 4-3 defensive end type, one that is almost always rushing the passer and/or mixing it up in the trenches. They then need a 3-4 outside linebacker type that will rush the passer and drop in to coverage and/or play in space. Lorenzo Carter should develop in a fine 3-4 OLB type but could be better suited for rotational duty, meaning he isn’t a guy you make plans around if a guy you really like is available. The Markus Golden/Kareem Martin duo is likely to fill the defensive end role, meaning they will always be rushing in to the trenches. Without any solid depth, I think NYG needs to attack both of these roles in the draft as early as pick 6 if the value is right. This defense is a train wreck when it comes to pass rush and they traded away Vernon, their top edge guy. NYG fans know that a quality and consistent pass rush makes all the difference in the world.